Astronauts at the International Space Station probably have enough to keep them busy, but soon they’ll have new aquatic pets to watch. The Japanese Space Agency, JAXA, launched an AQH Aquatic Habitat on July 20, which will remain at the ISS for up to 90 days of investigation, to inspect how life in space can impact marine vertebrates over multiple generations. Since microgravity can cause bone degradation and muscle atrophy, and increased radiation levels in space can create genetic mutations in future generations, biologists want to be able to observe both individual fish and their offspring. The AQH is designed to keep the closed-water habitat clean and safe for long periods, which, as JAXA engineer Nobuyoshi Fujimoto points out, “will make it possible for egg-to-egg breeding aboard station”--up to three generations of fish in one 90-day orbit. 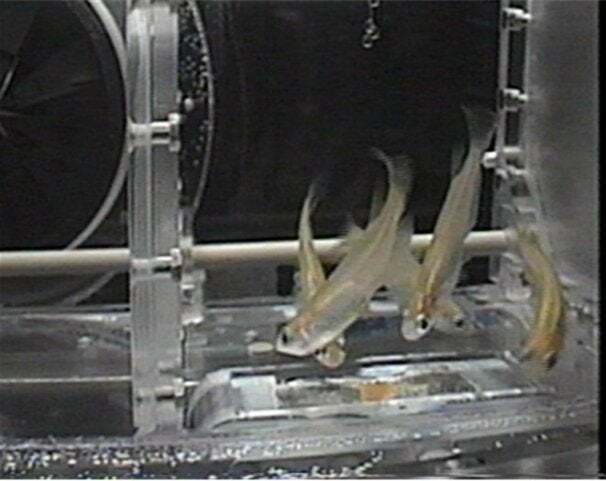 The AQH, a closed-system habitat that will reside in the Japanese Experiment Module in the ISS, contains several Medaka (Oryzias latipes) fish. It’s not the first time Medaka have been in space: Astronauts hatched a brood of O. latipes aboard the space shuttle Columbia in 1994, the product of the first vertebrates mating in orbit. This time, they’ll have a swanky habitat enabling multiple generations, and a completely-sequenced genome that creates an excellent basis for comparison. While the first AQH will only house fish, the habitat is also suitable for amphibians--yup, frogs in space. And even though the aquarium is equipped with an automatic feeder, light cycle, and monitors, maybe the ISS astronauts can take a few minutes to try and get the fishies to chase a laser pointer. Rachel Martin possesses encyclopedic knowledge of YouTube videos of animals chasing red dots.